Mac & PC on the ST: Three Computers in One - For Real? Spectre GCR from Gadgets by Small and pc-ditto II from Avant-Garde Systems, Inc. represent major upgrades to the Macintosh and PC emulation available for the ST. Both were shown publicly for the first time at the World of Atari show held at the Disneyland Hotel in Anaheim on April 22. Spectre 128 has improved with each software upgrade Version 1.9 includes support for sound, thus opening up a whole world of new Mac programs for ST users. The biggest problem with Spectre 128 is that you can't read Mac disks directly without Data Pacific's $300 Translator One. Instead, you must somehow get the information onto a Spectre-or Magic-formatted disk, either by having a Mac available or downloading from an information service (i.e. GEnie or CompuServe). floppy drive with only a single floppy port. Spectre GCR changes all that, It's a cartridge, somewhat larger than its predecessor - in order to accommodate a considerably larger number of chips and add two disk drive connectors. Spectre GCR plugs into the cartridge port as before, but then you must run the disk drive cable from your ST to the cartridge. The cartridge can be connected anywhere in the drive chain, although Dave Small recommends that it be last in the chain for best results. If it's not. you must run a cable from the second drive connector in the cartridge to your B drive. One example of when Spectre GCR cannot be the last drive in the chain is when you have an external floppy drive with only a single floppy port. Two questions arise immediately about Spectre GCR. First of all, does it work with Megas and 1040STs, with internal disk drives? It does indeed, since it controls the drives just by being in the chain-it doesn't have to be between the computer and the drives. Also, what happens if the cartridge is connected to the drives, but not plugged into the computer? Actually, nothing happens, except, of course, you can no longer emulate a Mac. Your drives continue to work normally, and you don't have to disconnect the drives from the cartridge. And how does Spectre GCR work? In a word, fast-real fast. It's faster than Twister-formatted disks, faster than Spectre- or Magic-formatted disks, and so much faster than Data Pacific's Translator One that it makes you wonder how you ever put up with those excruciatingly slow data transfers. In fact, Spectre GCR can read and write Mac disks as fast as the Mac itself- and the Mac is fast: an entire 800K disk can be read in 1 minute, 15 seconds. Spectre GCR is also easy to use. You don't need to know the format of the disk you are using. It can be native Mac format, Magic or Spectre Spectre GCR will figure out the correct format and read and write to the disk in that format automatically. And if you're in Atari's native GEM mode, Spectre GCR will recognize it and be invisible. The $299.95 price of Spectre GCR includes a complete Mac emulator (less the necessary Mac ROMs, which must be purchased separately) that can read and write Mac disks directly. Since it costs the same as a Translator One alone, it's clearly a better deal to buy Spectre GCR, thus getting the most advanced Mac emulator in the process. It's an even better deal for Spectre 128 owners: they can upgrade for $199.95 by returning their old Spectre cartridge to Gadgets by Small (but keep the ROMs -you'll still need those for the new Spectre GCR cartridge). As reported in this column in the May 1989 issue of START, pc-ditto II is now based in hardware in order to add speed to the excellent but slow PC emulation provided by pc-ditto. However, the design of pc-ditto II changed since that column and it is no longer a cartridge instead, it's a small circuit board that must be placed inside the ST. 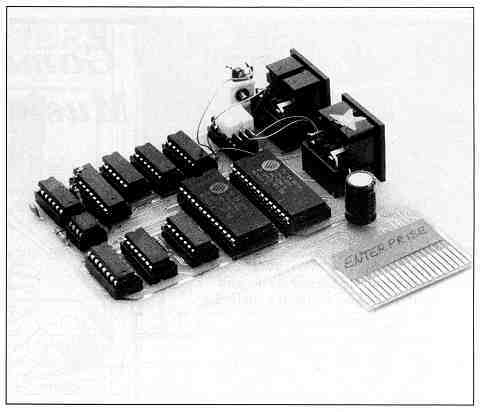 The installation is solderless, requiring nothing more than clipping the board to the 68000 CPU in your ST. However, since this involves opening up the ST, you should have it installed by a qualified technician if you are at all unsure of yourself "under the hood." If it will make you feel any better, I had mine installed by a technician-I'm not taking any chances with my $1,400 computer to save $25! Something else has changed about pc-ditto II too, something which makes it worth the extra trouble to install it. First, a little background: A "plain vanilla" IBM XT has an 8088 CPU which runs at 4.77 mHz. This is adequate, although many of the more powerful programs and complex animated games really come into their own only with the 80286 class of chips, which run at between 8 and 12 mHz. This chip is in the IBM AT (and clones). The Norton System Index (SI) has become a standard in the PC world. It measures how fast a computer runs and encompasses such elements as disk access, internal chip calculations and RAM! ROM access. An XT has a Norton SI of 1.0, while ATs generally range between 2.5 and 3.0. The original pc-ditto had an SI of about .2-about one-fifth the speed of an XT. And pcditto II? Well, it runs at an incredible SI of 3.0 -well into the AT range. The reason pc-ditto II is such an exciting product is that with this single development, a wide range of PC products has been opened to the ST user. Spreadsheets recalculate at full speed, modem programs work as designed and a huge selection of games become playable and enjoyable. In the months ahead, we'll look at some of the best of these programs, which heretofore couldn't be used effectively on our STs, and detail the operation of pc-ditto II. David Plotkm is a chemical engineer for Chevron U.S.A. and a Contributing Editor for START. Spectre GCR, $299.95. Gadgets by Small, Inc., 40 West Littleton Blvd., #201-211, Littleton, CO 80120, (303) 791-6098.
pc-ditto II, $299.95. Avant-Garde Software, 381 Pablo Point Drive, Jacksonville, FL 32225, (904) 221-2904.